This stylish and durable faucet is sure to give your kitchen sink a new look. Chrome finish with matching soap dispenser all solid brass construction which ensures durability and longer life. Faucet features spiral pull-down spray head for powerful spray and separate spout for aerated flow. Includes a spray face that resists mineral buildup and is easy-to-clean. Faucet sprayer reach: 12 in. The Esque Kitchen Collection's refined curves and cosmopolitan contours give it a clean, poised look that accentuates the fresh modernity of a contemporary kitchen or complements the tranquility of a transitional space. With Touch2O. Technology, it doesn't matter if you have two full hands or ten messy fingers. Tap anywhere on the spout or handle of the faucet with your hand, wrist or forearm to start and stop the flow of water. Delta ShieldSpray Technology cleans with laser-like precision while containing mess and splatter. A concentrated jet powers away stubborn messes while an innovative shield of water contains splatter and clears off the mess, so you can spend less time soaking, scrubbing and shirt swapping. Delta MagnaTite Docking uses a powerful integrated magnet to pull your faucet spray wand precisely into place and hold it there so it stays docked when not in use. Touch on. Touch off. With Touch2O Technology, it doesn't matter if you have two full hands or ten messy fingers. Tap anywhere on the spout or handle of the faucet with your hand, wrist or forearm to start and stop the flow of water. Thoughtfully designed to make kitchen tasks easier, Touch2O Technology allows you to turn the faucet on and off with just a touch anywhere on the faucet's spout or handle. It was the first innovation of its kind on the market, and now offers more styles, finishes and options than ever. Designed for precise, responsive control every time, no matter where you touch. You can easily control and change the water temperature above the deck using the faucet handle. All Touch2O models are water-efficient, underlining Delta's commitment to conservation. Chrome Pull-Down Spray Kitchen Faucet with Soap Dispenser This stylish and durable faucet is sure to give your kitchen sink a new look. Chrome finish with matching soap dispenser all solid brass construction which ensures durability and longer life. Faucet features spiral pull-down spray head for powerful spray and separate spout for aerated flow. Includes a spray face that resists mineral buildup and is easy-to-clean. 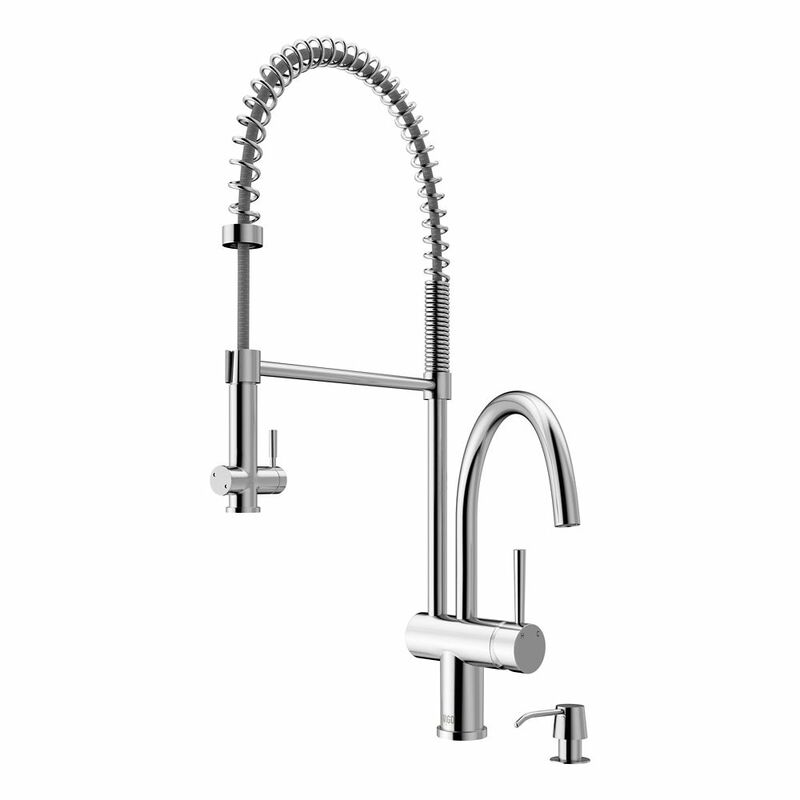 Chrome Pull-Down Spray Kitchen Faucet with Soap Dispenser is rated 4.4 out of 5 by 61. Rated 5 out of 5 by ANGELICA from The best faucet ever I bought this faucet for my kitchen that I recently remodeled. This faucet blew my mind. At first I thought it was too big but when it got installed it look so elegant in my new kitchen and a perfect size. In addition the 2 faucet in 1 works charms with my farmhouse sink because I use the regular one to do the dishes and the spray one to clean the corners of the sink from food. The last thing the whole faucet is made of stainless steel so is strong and I know is going to last me a long time. Rated 5 out of 5 by Aggravation from Fantastic Faucet This fantastic faucet has great features, but we have not yet had a chance to complete our addition. Rated 5 out of 5 by Ashford from This is awesome product We love Vigo product. Their quality is not different from Kohler’s. This faucet is very useful in kitchen without splashes. Rated 5 out of 5 by Angie V from Beautiful Faucet I purchased this faucet 3 years ago and have absolutely loved it. It is striking and everyone comments on it. But the absolute best part of this purchase was Christian Landazabal in Customer Service. He is knowledgeable and immediately sent me a part that I needed no questions asked. He even sent the part to me twice, when it was stolen out of my mailbox. It is basically impossible to get great customer service and a company that stands behind their products as Vigo does. It is much appreciated! Rated 5 out of 5 by KymP from Attractive & Functional - Happy with Christian in Customer Support I bought this product two years ago and have loved it. It is larger than the average pull down but that works great for filling large pots, etc. I recently contacted Customer Support for assistance to replace a leaking faucet handle. Christian was very helpful - verified my purchase and warranty and sent the replacement cartridge I needed. Rated 2 out of 5 by Jodiegirl77 from Saggy faucet head Loved it at first... now the faucet head sags and will not stay in place. Should’ve read the reviews beforehand. If there’s a lifetime warranty, can we replace or exchange for a different style? Poor design! !